Add a unique touch to your beach themed event with our seashell photo frame bookmark. Each combination bookmark frame favor features a clip for marking your page as well as a frame for holding a cherished photo. The shiny silver metal frame is accented with a seashell decoration and has an opening that holds a 1" x 2" photo. 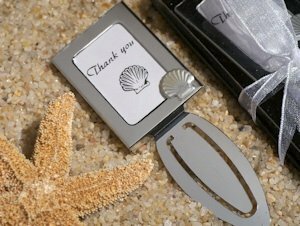 We package these seashell party favors in a black gift box finished with a white ribbon. Measures 1.5" x 2" and is 3" long.